Walking with Jesus: Day 58: Acts 17:1-9 & Proverbs 20:25-30 - How Does the Gospel Turn the World Upside Down? 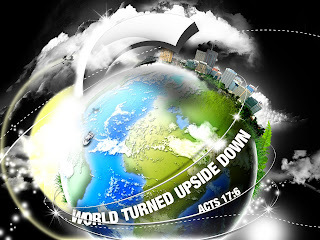 Day 58: Acts 17:1-9 & Proverbs 20:25-30 - How Does the Gospel Turn the World Upside Down? How Does the Gospel Turn the World Upside Down? The reception Paul and Silas received in Thessalonica has become quite familiar by this point in the Acts. Thessalonica had a synagogue, unlike Philippi, so Paul and Silas went into the synagogue and reasoned from the Scriptures on three consecutive Sabbath days. Some of the Jewish men became convinced and professed faith in Jesus. Even more of the God-fearing Greeks, who would be on the periphery of the synagogue, came to faith in Christ, along with several of the leading women. The Gospel was once again bearing fruit and being used by God to bring people to eternal life. 1. The mob could not get their hands on Paul and Silas, so they arrested their hosts instead, including Jason. 2. The accusation against Paul and Silas was that they were men "who have turned the world upside down." Today, we think of the Gospel as a simple and peaceful religious message of God's love. Why did these Jewish leaders see it as such a threat? Why did they accuse Paul and Silas of turning the world upside down? How does the Gospel turn the world upside down? The Gospel is powerful and disruptive on many levels. Trolling around on social media and comment threads will show you very clearly that the Gospel generates a level of hostility unmatched by any other religion. The reason is simple: The Gospel violates all human expectations and upends all human systems of self-salvation or self-glory. The Gospel strips us of all claims to self-righteousness. For the Jewish men, circumcision and their Jewish national citizenship distinguished them as the most righteous group of people on the planet. For all people, religions based on self-effort are considered safe and normal, but religions based on grace alone are a threat to all of our performance-based thinking, and the truth that Jesus is Lord disrupts our personal kingdom-building. But those who have eyes to see the glory of grace and the wonder of Christ's kingdom see the benefits of the Gospel clearly and rejoice. The Gospel strips us of our self-righteousness only to clothe us in the perfect righteousness in Christ. The Gospel humbles us so that God may exalt us to His right hand. We lose our pathetic temporary kingdoms and gain His eternal kingdom. Heavenly Father, thank You for opening our eyes that we may see Your glory in the face of Christ Jesus. Thank You for taking away all of our claims to any righteousness of our own and clothing us in Your perfect righteousness instead. Give us the grace to proclaim the Gospel and joyfully accept whatever reception comes. In Jesus' name, Amen. Heavenly Father, we need Your Holy Spirit to apply the perfect righteousness of Christ to our souls, that we may be careful and not rash, that we may walk in steadfast love and faithfulness, that we may be steady in the face of evil and may be used by Your to bring healing and peace. In Jesus' name, Amen.